The Dawn of War franchise is divisive. The first two entries in the series are a bit like geometry and trigonometry—you only enjoy one or the other, not both (real talk: no one actually likes math). It’s been said many times before, but it’s worth repeating: Dawn of War I and Dawn of War II were very different games. The first was a traditional RTS with large armies and bases, and the second was focused on small numbers of powerful units that gained skills and levels throughout the campaign in an RPG fashion. It is these differences, along with the divided fan base, that have made Dawn of War III what it is. Dawn of War III’s story is straightforward, too much so. The Space Marines, the Eldar, and the Orks—the game’s three main factions—are at it again. The defiant but just Chapter Master Gabriel Angelos, the enigmatic Farseer Macha, and the shrewd but savagely hilarious Gorgutz are set to duke it out once more. This time around they’re fighting for control of an ancient weapon on the mysterious planet of Acheron. Each faction must confront its own internal conflict while also trying to out maneuver their alien counterparts in the race to reach the Spear of Khaine, an artifact prophesized to wield great power. Without giving anything away (although you wouldn’t be missing much if I did), I’ll just say that the narrative is disappointingly linear and predictable. Dawn of War III’s single-player mode features all three races, instead of a separate campaign for each. With a grand total of 17 missions, you’ll be in the command chair of a new army on nearly every level. Although this perspective switching mechanic can work well in other genres, it doesn’t mix well with RTS games, at least not this one. Even for experienced strategy players, learning the intricacies of a particular force takes time. Unfortunately, Dawn of War III doesn’t easily allow for this. Just as you’re starting to get comfortable with the skirmishing Eldar, for example, you’ll find yourself leading the scrap-loving, blunt force Orks or the adaptable Space Marines on the next mission. This is unpleasantly jarring for two other reasons as well: it hurts narrative immersion and it necessitates that the tutorial phase of the campaign drags on for far too long. While the narrative leaves something to be desired, the battles in Dawn of War III are absurdly impressive. Now that base building has made its triumphant return to the series, large scale clashes of futuristic weaponry are once again the norm. Small units, large units, and truly massive units that tower over the fray consistently deliver truly epic battles crisscrossed with the bright streaks of energy beams and ripe with beautiful and satisfying destruction. Relic’s artistic direction, graphics, and animations, are truly magnificent. The Eldar Wraithknight, for instance, is shockingly awesome (yes, I was actually in awe) with its leaping sword-slide ability. Despite featuring impressive, intensely action-packed battlefields which are overflowing with all sizes and ranges of unique units, performance remains silky smooth. Even though bullets, energy beams, and bombs are flying every which way, the experience has been carefully designed so that it’s never too confusing or chaotic to figure out what’s going on. However, I would’ve liked more clear notifications as to when my outposts or units were being attacked if I was concentrating elsewhere. The Orks, the Eldar, and the Space Marines have nicely separate playstyles but maintain a well-balanced feeling. The Eldar, or the space elves as they’re affectionately known, specialize in mobility; they’re fast and pack a punch, but weak in protracted engagements, so they’re best suited to hit and run tactics. Their buildings, which can be teleported around the map or used as teleportation gateways, allow the Eldar to make quick strikes and swift escapes. Orks, on the other hand, march to war with piles of scrap and loads of swagger. Although Orks generate resources through control points like the other factions, salvaging scrap is a major part of this army’s economy. Entirely new units can be constructed out of particularly lucrative junk piles and individual units can also give themselves a quick battlefield upgrade by looting wreckages. Waaagh (that’s Orky for “war”) towers, which advance the Ork tech tree, also produce their own piles of junk for ‘da boys to rummage through. And then there’s the Space Marines, the face of Games Workshop’s Warhammer 40,000 universe. Although the Emperor’s finest feel a bit more squishy and a bit less “killy”—if I may borrow some Orky slang—than they did in either Dawn of War I or Dawn of War II, they’re adaptable and very dangerous once they’re well established. Up to three drop pods, loaded with your choice of fearsome Space Marines, serve as a swift but disposable reinforcement method that’s launched from orbit, causing disruption and destruction to the enemies upon whom it lands. Relic clearly intends to make matches faster, less defensive, and more hotly contested, both in single-player and multiplayer. Base turrets are gone entirely; they can only be placed directly on resource points now. Power generators have also left the building (er, base), being relocated to resource points as well, making these spots far more valuable than ever before. In addition, resource points seemed far more scarce than in Dawn of War I, so resources trickle into your coffers more slowly. Make no mistake, these areas are not just your army’s lifeblood, they are now quite literally the key to victory. While these modifications were clearly made in consideration of multiplayer, I do wish a more defensive style with greater resource generation was an option during campaign play. What’s strange about this push towards a faster paced game is how it seems to clash with the excessive micromanagement necessary in Dawn of War III. With the addition of three elites per battle (more on this soon), most of whom have two or three abilities, and the single ability that many line units also have, it can get a bit overwhelming. Separating your forces into well-organized control groups and memorizing the hotkeys for abilities is an absolute necessity, especially if you want to have any chance at victory in multiplayer. For better or worse, Dawn of War III is something of a hybrid. While it presents itself as a traditional RTS, it draws inspiration and ideas from both its immediate predecessor and a currently popular multiplayer game genre. Elites, which can be unique squads or individual lord units, are an integral part of this game’s DNA. 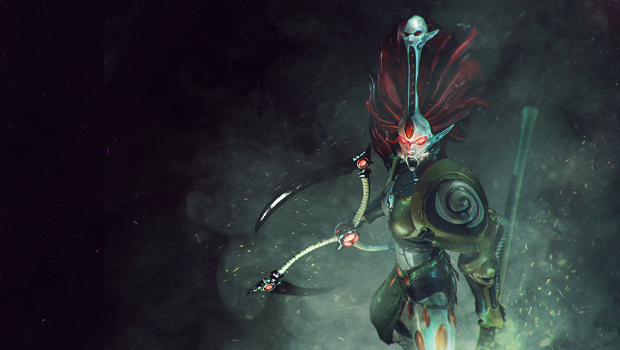 They’re simultaneously an homage to Dawn of War II and an attempt to capture interest from MOBA fans. Many of them are powerful enough to turn the tide of a losing battle, and all of them, if used effectively, can give you a significant advantage. Your battle roster includes three elites of your choice per match that can be deployed to the field after accruing a sufficient amount of the new elite currency. Killing elites is never easy, but the loss can be devastating for an opponent, especially with the lengthy cooldowns elites suffer from. Elites gain experience during matches, earning you access to unique doctrines. Doctrines are a set of passive and/or active abilities which buff certain aspects of your army, and thus, may also alter your tactics. These doctrines are chosen before a match, some are active only when a certain elite unit is on the field, while others are active at all times during a session. Only one multiplayer match type exists at launch and it, again, bears similarity to MOBAs. Your ultimate objective is to raze your opponent’s power core, but you must destroy a shield generator and a turret first. Hopefully more game types will be added later on; it feels light on content at present. Although I’m probably one of the few fans who enjoyed both previous games in the series, Dawn of War III was still bittersweet for me. On the one hand, it’s indisputably the best looking RTS ever made. It is truly a visual masterpiece, one that perfectly captures and celebrates the intricacies of Warhammer 40,000’s distinct aesthetic and smashes it all loudly together on gorgeous maps. Base building is back and battles are incredible. On the other hand, its campaign narrative was unimpressive and awkward. Micromanagement has gotten excessive and launch content is light. Hopefully these issues will be rectified in the months to come with more multiplayer modes, factions, or even a Dark Crusade-esque expansion. Can we have Necrons next, please, Relic? Warhammer 40,000: Dawn of War III releases today, April 27. Dawn of War III is the best looking RTS out there. It boasts graphics, art, and animations that are unparalleled within the genre. Its battles are beautifully crafted, wildly entertaining, smooth, and polished. However, the single-player experience suffers from predictable flatness and a drawn out tutorial phase, while multiplayer content is in need of additional content.